The Adventures of Bayou Billy, released in Japan as Mad City (マッド・シティ, Mad City? ), is an action game developed by Konami for the NES and Famicom. It is composed of fighting, driving and shooting segments. It was originally released in Japan in 1988, and later in North America in 1989 and in the PAL region in 1991. The player takes control of the title character, Billy West, who must fight to save his girlfriend, Annabelle Lane, from the gang of Godfather Gordon. There are a total of nine stages in all: five side-scrolling beat-em-up stages (or street fighting stages, as the game dubs them), two light gun shooting (shoot-'em-up) stages, and two action driving stages. In addition to the main game, there's a practice mode where one can play through one of the three segments from the main game and familiarize themselves with the controls. When one of the practice stages is completed, the player will gain a power-up that can be used during the main game. 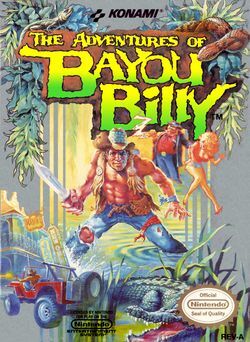 Billy West is a Crocodile Dundee-esque survivalist who lives in the bayous of Louisiana and fights both gators and criminals in his spare time. He is dating Annabelle Lane, a popular journalist and model. Godfather Gordon of Bourbon Street, tired of Billy constantly interfering with his various sundry crimes, kidnaps Annabelle in an attempt to get Billy out of the safety of his wild home and follow him to his fortress on Bourbon Street, leaving behind traps and henchmen along the way.